The process of producing protein from a DNA – deoxyribonucleic acid – sequence includes two major steps: transcription and translation. During transcription, a messenger ribonucleic acid, or mRNA, is created from the DNA template. This mRNA combines with a ribosomal RNA, known as rRNA, and transfer RNA, or tRNA, complex to translate the mRNA code into an amino acid sequence, a protein. DNA is made up of a sequence of nucleotide bases. The four bases are adenine, thymine, guanine and cytosine. The sequence in which these bases occur on a strand of DNA ultimately codes for the production of certain proteins. After the cell manufactures the proteins, they can be used structurally or in various metabolic processes. 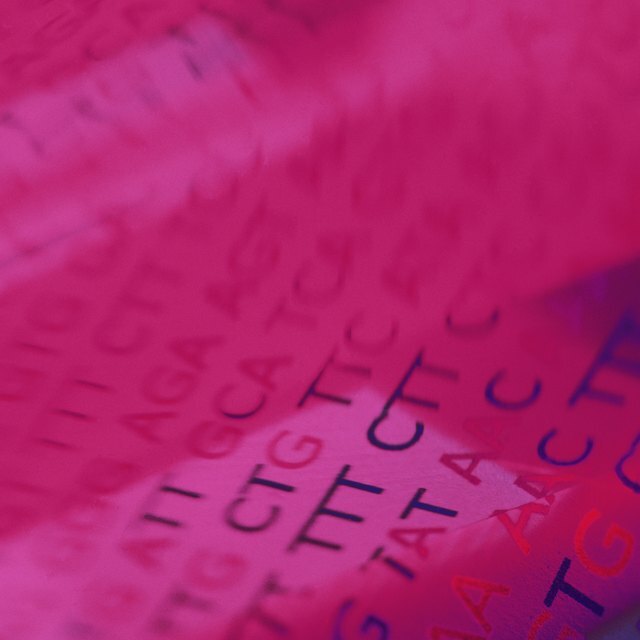 Create an mRNA transcript of the DNA sequence. Each base in DNA matches another base. Pictures of DNA typically show it in a double helix, with the bases on one strand connecting via bonds to the complementary bases on the opposite strand. Complementary bases are: adenine (A) and thymine (T), and cytosine (C) and guanine (G). So if one strand of DNA reads A-C-G-C-T-A, then the complementary strand is T-G-C-G-A-T. You can find the sequence of the mRNA transcript in the same way, by using the complements of the bases shown in the DNA sequence. RNA, however, does not contain the base thymine (T); instead, this base is replaced with uracil (U). When you come across an adenine (A) in the DNA sequence, match it with a uracil (U). If the DNA sequence is A-A-T-C-G-C-T-T-A-C-G-A, then the mRNA sequence is U-U-A-G-C-G-A-A-U-G-C-U. Create a tRNA anti-codon sequence from the mRNA transcript. Each tRNA has a set of three bases on it known as an anti-codon. The anti-codon matches complementary bases in the mRNA sequence. To determine the overall anti-codon sequence that will match a strand of mRNA, simply retranscribe the RNA sequence; in other words, write out the complementary bases. Using the previously noted mRNA sequence, the tRNA anti-codon sequence is A-A-T-C-G-C -U-U-A-C-G-A. Break the tRNA sequence you found into three-base sets. Because anti-codons are made up of three bases at a time, a better way to write the anti-codon sequence A-A-T-C-G-C -U-U-A-C-G-A is AAT-CGC-UUA-CGA. You can find the anti-codon sequence even more quickly by simply writing the DNA sequence, using U for uracil in place of T for thymine. Then split the sequence into the three base anti-codons. You may use the anti-codon sequence to match to the proteins added by each tRNA during translation, creating an amino acid sequence. Verify, though, that the amino acid reference chart you use is for anti-codons, (see Resources). Many amino acid sequencing charts simply list the matching mRNA codons instead of tRNA anti-codons, allowing you to skip the step of determining the anti-codon sequence. The sequence of the tRNA molecule is simply an RNA transcription of the DNA sequence used to create it. Catherine Carney is a biologist with a background in research and education. She received her Master of Science in biology from University of North Carolina at Greensboro in 2009. Carney began writing professionally online in 2011, specializing in science and health. What Is the Complementary Base Pairing Rule? How Does DNA Translation Work? Carney, Catherine. "How to Get a tRNA Sequence from a DNA Sequence." Sciencing, https://sciencing.com/trna-sequence-dna-sequence-8566482.html. 13 March 2018.